*PLEASE NOTE, private commissions are not available at the moment due to being fully booked. Thank you. Based on your own thoughts and ideas I can create a work of art, in my own style, which is completely unique and personal to you whether it be a treasure for your own home or a gift for someone special. From painting your garden or home to a make believe scene filled with your favourite wildlife and flowers, the possibilities are endless. Via telephone, post or email I work with you, the client, and produce sketches and designs for you to choose from. If you are fairly local, I can visit you in person. I can work with photos or just simply verbal ideas on themes, colours and subject matter. Once a design and size is chosen, I then go to full art work . (Framing for your finished painting can be arranged and will be quoted for separately). 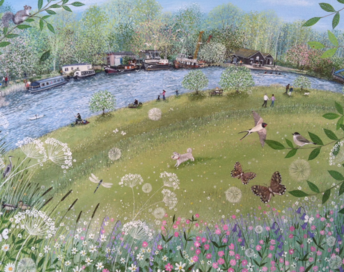 Please see below for some examples of my private commission work and click here to read what some of my clients have said about their commissioned pieces of art. Size: 300mm x 400 mm approx. Size: 300mm x 300 mm approx. Size: 250mm x 300 mm approx. Size: 300mm x 350 mm approx. Size: 255mm x 360 mm approx. Size: 300 mm x 450 mm approx. Size: 230 mm x 260 mm approx. Size: 100mm x 150mm approx. Client's brief - my client asked me to create a wedding reception invitation which summed up the time of year (a cool November day) and the location of Ickworth House, Bury St Edmunds. She left me to decide on most of the detail and only asked that Ickworth rotunda be in the scene somewhere and that I use her favourite colours of duck egg blues and taupes. Size: 200mm x 250mm approx. 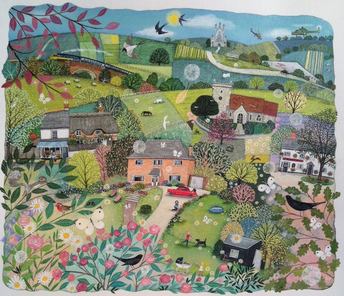 Client's brief - my client wanted to surprise a very good friend of hers with this painting for her 50th birthday. She has a beautiful home that my client wanted to capture and chose a winter scene to offset the warm colours of the house. Client's brief - my client wanted to surprise his wife with this painting for her 40th birthday. 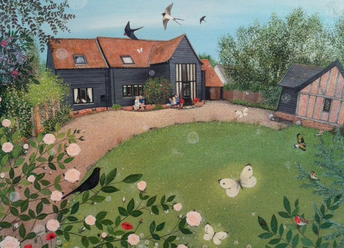 Client's brief - this painting was commissioned by my client as a special present for her husband. 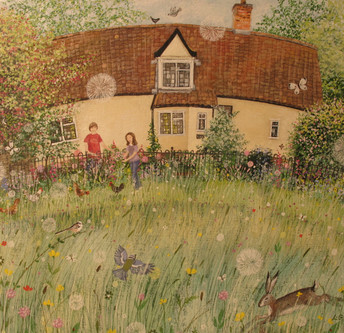 The painting was to include everything they love - their four children, pet sheep, dogs and cat - all in their beautiful garden and wildflower meadow. 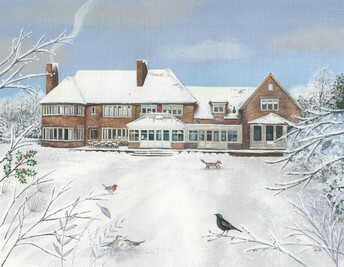 Description: my client has previously commissioned a summer painting of her home and gardens in wales and wanted a snowy winter version too. I painted in the family's mountain view and another angle of the house along with all the children in their bright winter clothes. Client's brief - my client wanted to commission this painting as a special birthday present for her husband. 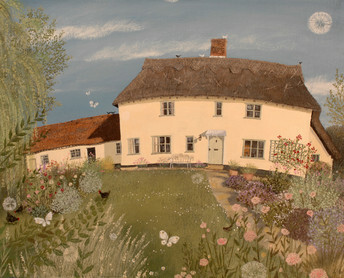 I painted her lovely cottage with her children at the front gate along with lots of wildlife. 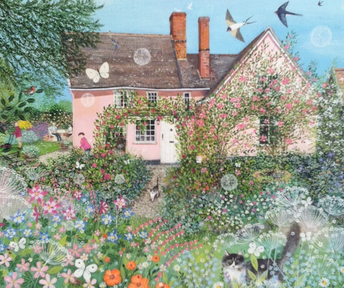 The cottage sits at the edge of a very pretty village green which is covered in wildflowers in the summer, so this was perfect to include in the painting. 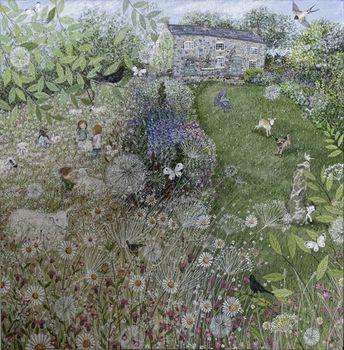 Client's brief - when I visited my client at her home, I realised that she had so many special areas of the garden that it couldn't possibly be painted from one angle. 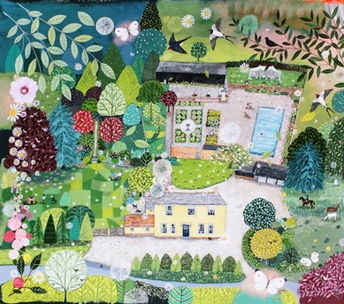 we decided on a naiive composition which encompassed all the lovely gardens, meadow and house. Also included are all the family members, horses, and pets. 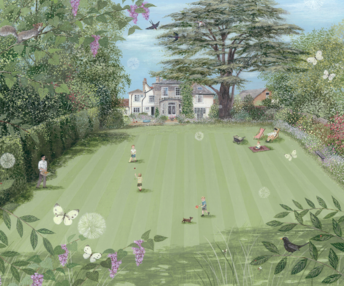 Client's brief - my client commissioned me to paint a really special picture for her mum's 70th birthday. Her mum loves her garden and is always in the greenhouse. She particularly loves irises so these became a main feature. Tewkesbury Abbey is also very significant to her so I painted that into the background as well. 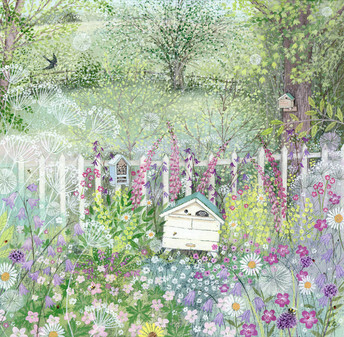 Client's brief - I was commissioned to paint a picture of my client's beautiful woodland, wildflower garden including their special bumblebee hives. They wanted an original painting but also needed an image for their business selling bees and hives. The painting will be printed on literature and will appear on their website. Client's brief - a special birthday present for my client's husband. 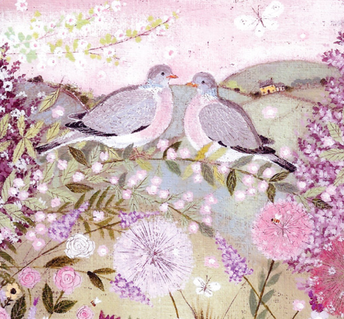 He particularly loves the wood pigeons that frequent his garden so I made these the main focus. 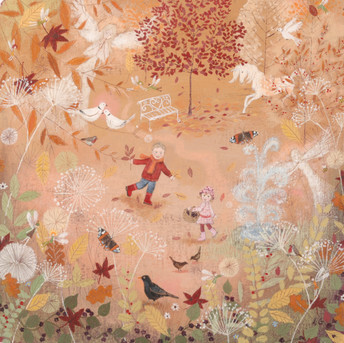 Client's brief - my client wanted her children painted into a magical autumnal garden scene, to include a water fountain, garden fairies, angels and a unicorn as a special gift for her husband's 40th birthday. The scene was an imaginary fairytale scene with lots of interesting little details to spot. Client's brief - this painting was commissioned by my client for her husband's Christmas present. 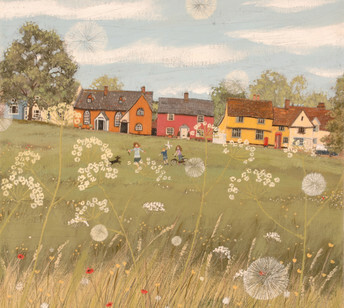 She asked me to include her little boy, the family pets and her husband's treasured vintage car within a favourite scene in her village. 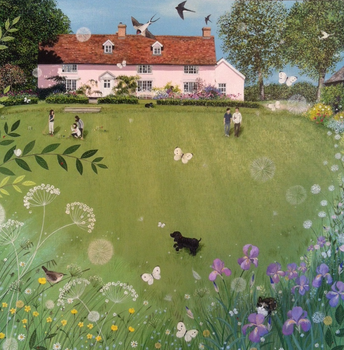 Client's brief - my client wanted her beautiful old house painting and to add extra interest, I was asked to include her friend walking by with her two gorgeous little dogs. 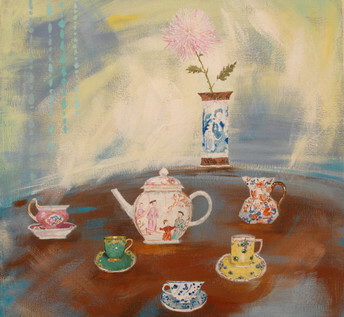 Client's brief - my client had a beautiful collection of exquisite china and I was asked to pick out several of the lovely pieces to paint onto canvas. 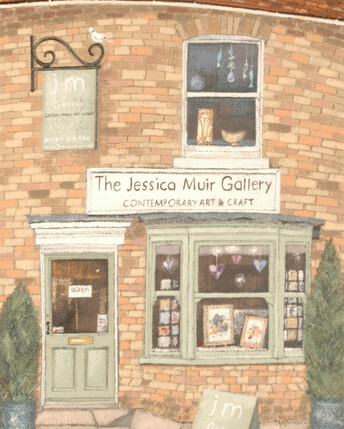 Client's brief - to paint the gallery's shop front for use on her business cards. 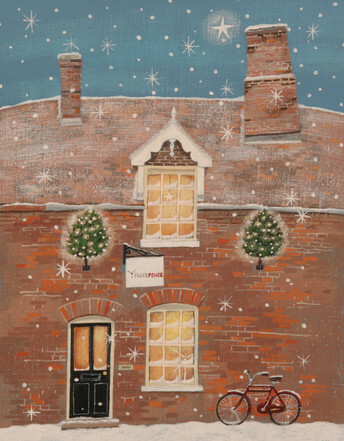 Client's brief - to paint the business shop front in the snow for use on a company Christmas card. 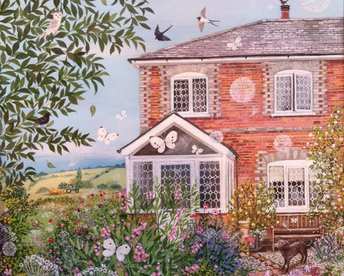 Client's brief - my client's asked me to paint their beautiful home and garden. 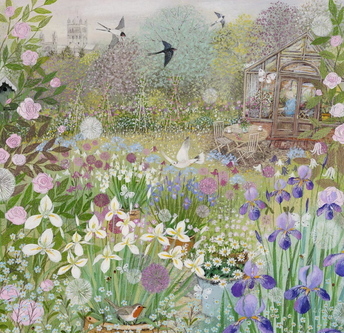 I included their happy chickens and emphasised the summer flowers in the foreground. 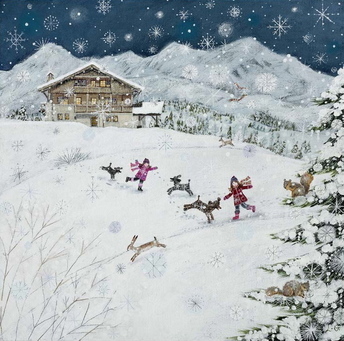 Client's brief - my client wanted me to paint her children and dogs playing in the snow near their new home in the Alps. She asked if the scene could be really magical with sparkly snowflakes and ice crystals, almost Christmassy, with little wild animals added in. 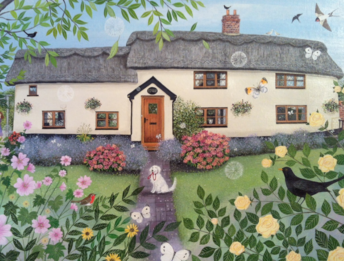 Client's brief - (also see Rose Cottage in Summer COM 18) - my client asked me to paint her charming little cottage both as a winter scene and as a summer scene. 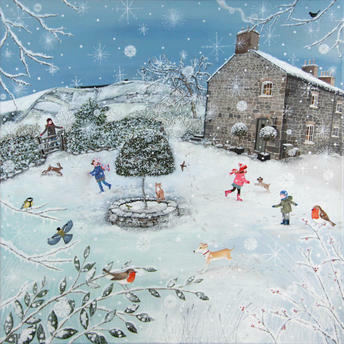 The winter scene was to include muntjacks and winter birds not to mention the family cat! 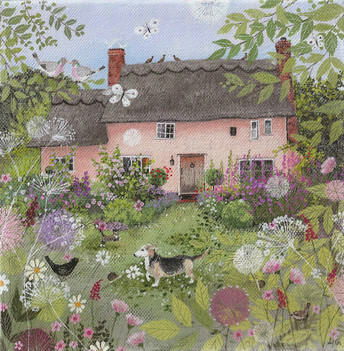 The summer scene was to include lots of beautiful flowers, birds and my client's lovely dog. I was provided with a set of fantastic photos which had been taken in both seasons which really helped to get the contents of the paintings correct whilst at the same time keeping them full of life and movement. 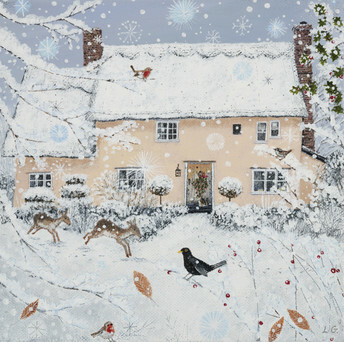 Client's brief - see COM 17 Rose Cottage in Winter. Painting on textured paper using acrylic paints. 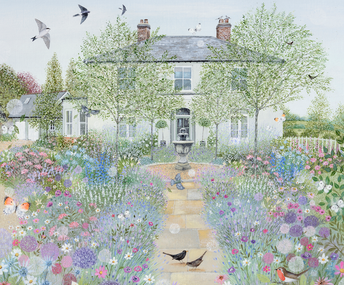 Client's brief - As my client was moving to another country, she wanted to have a painting of her cherished home in England to take with her. 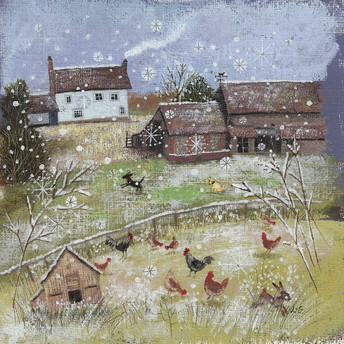 The painting was to include the wonderful old barn in the back yard, her two dogs and collection of chickens all within a wintry, frosty scene. 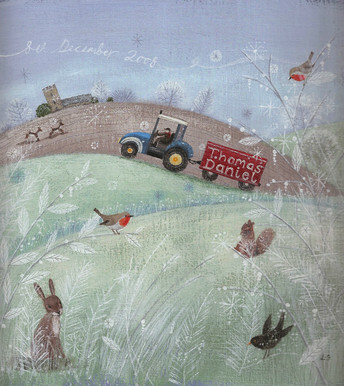 Client's brief - This painting was commissioned as a special Christening gift for a little boy. The steam train has the little boy's name and Christening date running down the side of the carriages and in the background is his home and the church where the Christening took place. 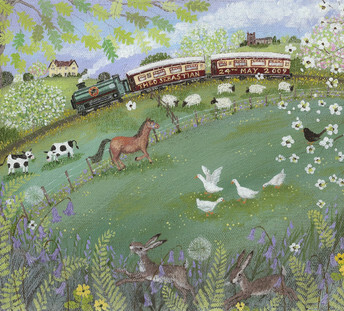 The actual Christening day included a trip on this particular railway through the countryside in May so the painting is a reminder of this special day as well as being something to keep forever. Client's brief - This painting was created to mark the birth of a gorgeous new baby boy. In the scene, the tractor trailer has the little boy's name on it and in the sky is his birth date. 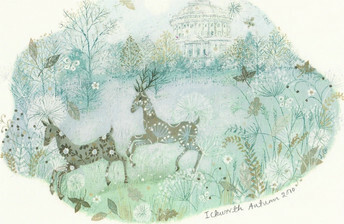 The scene depicts the wintry, frosty, bright weather of the time when he was born. Client's brief - With my client's wedding approaching, she wanted a special painting created to give to her parents as a thank you gift. 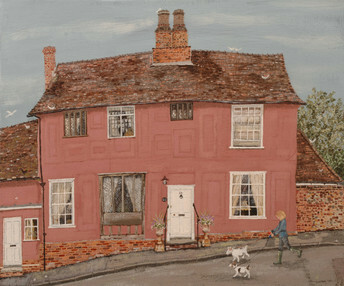 The painting was of her parents home and garden where the wedding reception was held and in the background was the church where the wedding took place. 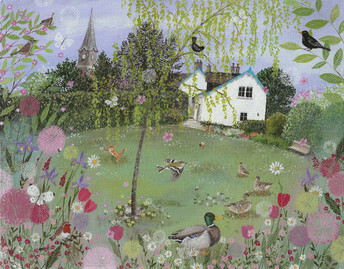 I was asked to include lots of garden birds such as Dunnocks, Blackbirds and chaffinches and also the Mallard ducks which live on the garden pond. Client's brief - This painting was commissioned for a special birthday gift for my client's husband. 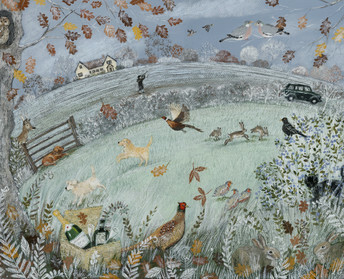 The painting was to be a collage of all the things that he held dear in his life - being in the beautiful countryside, country sports and his beloved Golden Retriever dogs. 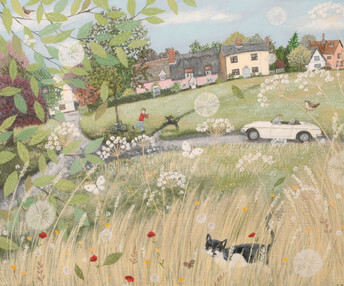 His Range Rover also featured in the painting along with a hamper of champagne and sloe gin(!) as a reminder of wonderful wintery days out. Client's brief - This painting was to capture the wonderful summery, bright feel of my client's coastal home as a special gift for her husband. 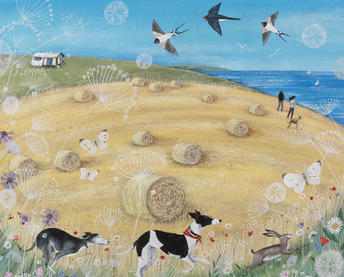 She wanted to include her two lovely children and the family's pet black Labrador dog. 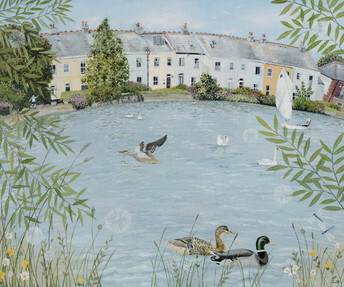 Also featured were ducks and swans which frequent the mill pond.